Though Southeast Asia in general and Thailand in particular has a rich diversity of art both ancient and modern, much has failed to make a deep impression on me. Part of this is due to my familiarity and artistic grounding in more European styles of art, from the Rennaissance to the Post-Impressionists. 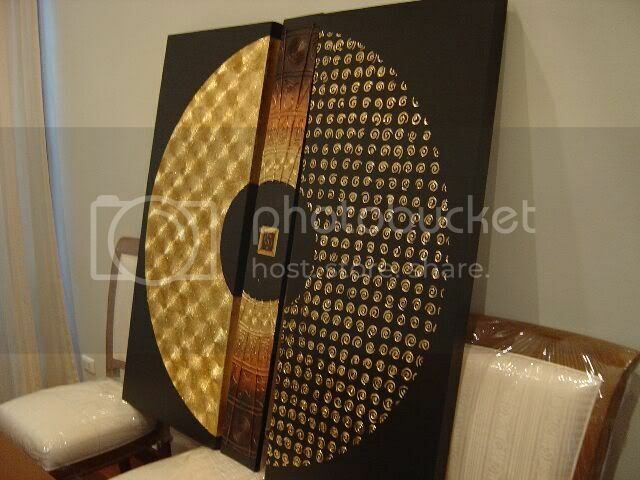 Part of this is also due to the Buddhist themes that permeate much of Southeast Asian art. And though I’ve been a lifelong Buddhist, I’ve never really been all that appreciative of blendings between the religion and art forms. Until now. If you are interested in Buddhism, art, or both, and have never heard of the name Puritat Dangharm, then make the effort to learn about this extremely talented Thai artist. My wife and I first stumbled across his work last year when we came across one of his galleries as we wandered about Chatuchak Weekend Market. 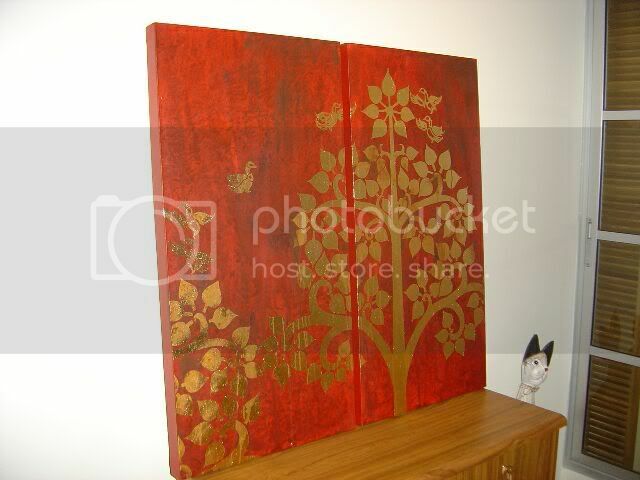 His use of Buddhist imagery and technique of using split panels were both achingly beautiful and spiritually moving. We spent an hour in the small, cramped gallery gazingly longingly and wistfully at the gorgeous pieces adorning the walls. 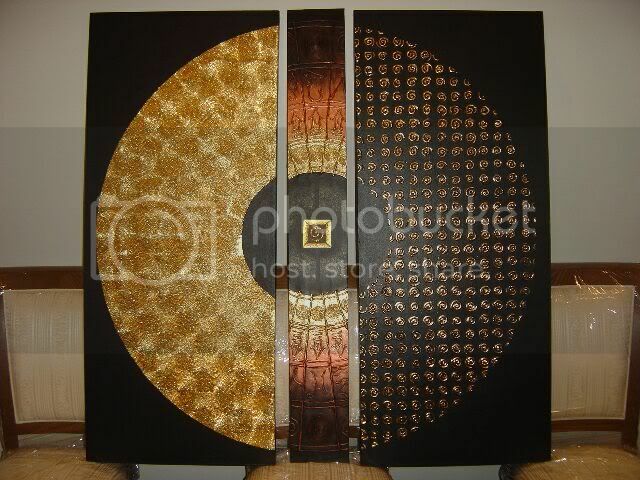 We resolved that once our new house was completed, more than a few of Khun Puritat’s pieces would become key centerpieces of our home and sanctuary. Last night, the wife and I spent day 2 of the Songkran (Thai New Year) holiday lounging at the Suan Lum Night Bazaar, grabbing dinner at the beer garden and wandering about the many merchant stalls looking for knick knacks with which to decorate our recently completed home. Much to our surprise and delight, we discoverd that Khun Puritat had opened another gallery at Suan Lum (aptly named the Puritat Art Gallery). Looking at his current pieces, we wound up falling in love with his work all over again. This piece was the one that captured my wife’s attention and heart. 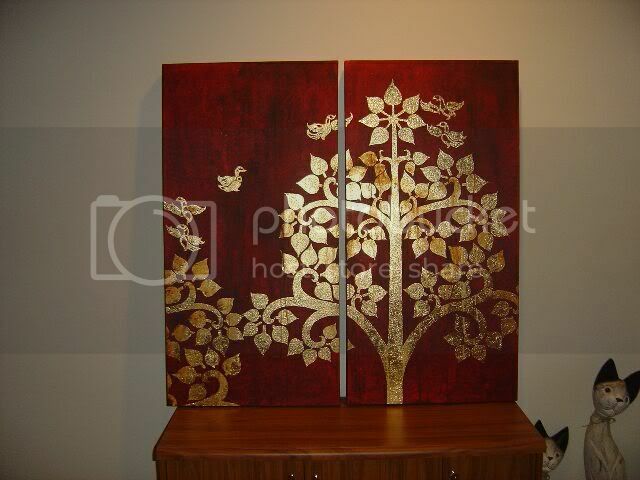 She was captivated by the use of the red paint and the gold leaf, creating both a striking yet soothing effect. 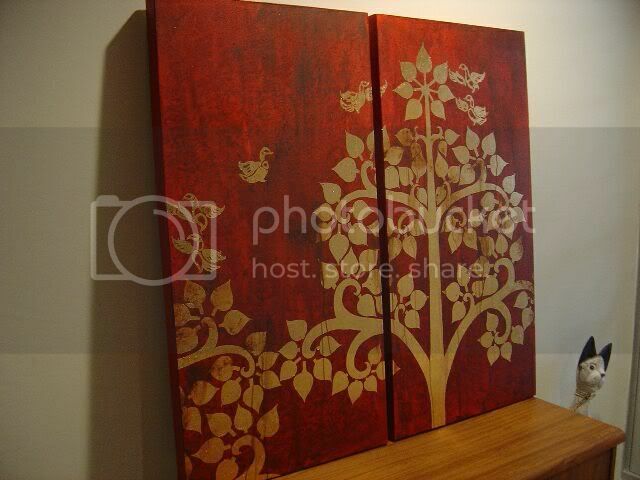 The tree represents the one that the Lord Buddha had been meditating under when he attained enlightenment. And this piece I knew I had to have. 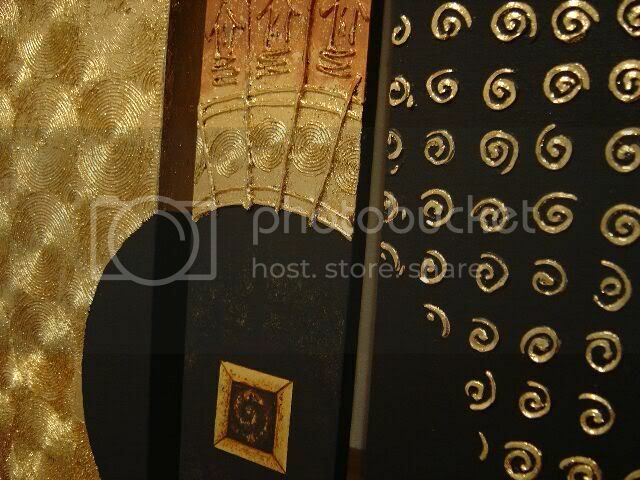 We love the artist’s use of gold leaf. I was mesmerized with his ability to blend three different religiously-oriented patterns painted on three different canvases into one seamlessly integrated pattern. I find his circular pattern simultaneously simple, powerful, and hypnotic. We were not the only ones enamoured of this piece. After we asked the artist to wrap it up for us and sought out an ATM to withdraw cash, we returned to find another couple who attempted to make an offer on the very same piece. By the end of the evening, we dropped a cool grand (Baht 40,000) on the two pieces; certainly not chump-change by any means, but definitely not an outlandish sum for such masterful work. I’ve never been much of either a prodigious collector or a discriminating connoisseur of the arts, but I know what I like when I see it, and if I don’t have to break the bank to acquire something truly beautiful, then why not indulge a bit? If you find yourself in Suan Lum Night Bazaar, please pay this gifted gentleman a visit, even if it just to get a look at some of his truly inspired work. I like the first picture of the one your wife liked, but the other two look too red for me. I still prefer your choice though because, it just looks cooler.